The important driver increasing growth in the global smart water management market is the rising demand from smart city projects. Smart city consists of smart energy, smart buildings, smart mobility, smart governance, smart infrastructure and more. Water management is a major provision in the smart city agenda. Smart energy consists of smart grids, smart meter and intelligent energy storage. Rising investment for achieving smart city projects is fueling growth in the smart water management market. High initial investment and water utilities that are apprehensive of adopting cloud services are the major factors hindering the smart water management market. The high cost of installing smart water meters for the water management is a major restraining factor for the global smart water management market. The high cost of smart water meters slows the adoption of smart meters which in turn hinders the growth of the smart water management market. A smart meter can cost as much as seven times the regular analogue spinning meter. The average cost of the regular analogue meter is about $ 25-30. While the cost of installation of smart meters is around $180-200 per house, this price range can go high with a large number of installations. The global smart water management market segments include solutions, services, advanced water meters and product type. The report scope is widely categorized on the basis of its components which include solutions and services. Moreover, the market revenue estimates and forecast includes only smart water management systems and excludes the traditional water meters. North America is anticipated to account for the largest market share of the global smart water management market during the forecast period. Its growth is propelled by the high number of people residing in urban areas, increasing investment in water management projects coupled with the high investment in smart city infrastructure. U.S. and Canada have a high percentage of the population residing in urban areas. As per the recent census (2016), 80.7% and ~80% of the population reside in urban areas in the US and Canada respectively. Providing proper water supplies to the residents and focus towards efficient water management have led to the high adoption of smart water management solution in North America. High investment to deploy new efficient water management solutions have also positively aided the growth of smart water management market in North America. On the other hand, the Asia-Pacific market is anticipated to be the fastest-growing region for the smart water management market over the forecast period. Countries like China, India and Japan are the major contributors to smart water management market in this region. 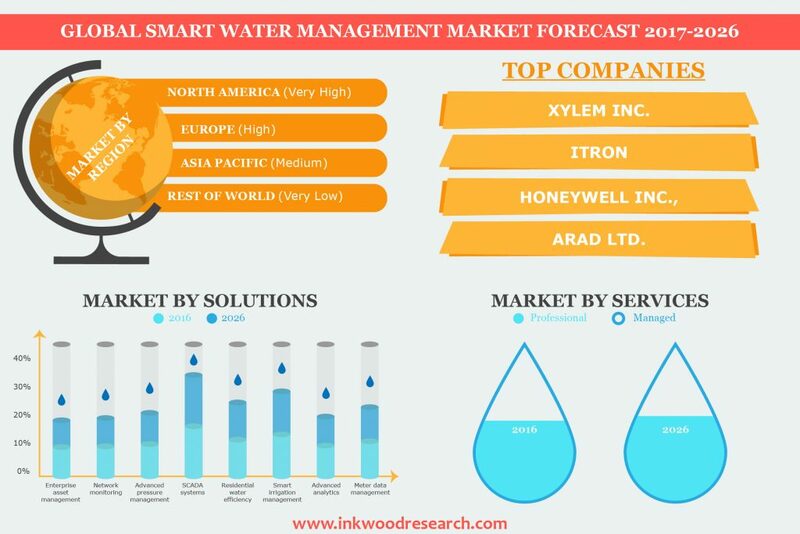 The Smart water management market is segmented based on solutions which are sub-divided into enterprise asset management, network monitoring, advanced pressure management, SCADA, residential water efficiency, smart irrigation management, advanced analytics, and meter data management. The market is also segmented on the basis of services which are sub-divided into professional services and managed services. The smart water management market segmentation on the basis of advanced water meters includes meter type and meter reading technology. These companies are using organic and inorganic strategies for growth. For instance, in January 2016, Honeywell completed the acquisition of Elster division of Melrose Industries Plc. Elster was the world’s largest electricity, gas and water measurement and control providers. Through this acquisition, Honeywell has expanded its smart water solutions among more than 130 countries across the globe. In June 2016, Itron Inc made a collaboration agreement with WaterSmart Software, to optimize water efficiency and consumer engagement applications. This acquisition deployed Itron’s water Advanced Metering Infrastructure (AMI) portfolio in North America to include WaterSmart’s innovative consumer engagement technology. Key findings of the global smart water management market. Ageing water infrastructure, restricting water loss and increasing efficiency in urban regions, and rising demand from smart city projects is fueling growth in the global smart water management market. North America is anticipated to account for the largest revenue share by 2026. Product launch is the key strategy adopted by various market players of the global smart water management market. Meter type is a major segment of the advanced water meter market.